Wrestling season is in full swing in New England and on February 6th at NEF 21, several former top-ranked state champion wrestlers will be stepping into the cage. As a result, NEF will be profiling these high caliber athletes over the next few weeks as part of our new ‘Wrestling For Fighting’ series. Stay tuned as we ask questions to learn more about why it’s so important to start in the sport of wrestling early and how a strong wrestling base can lead to success in the MMA cage. Today we’re speaking with C.J. 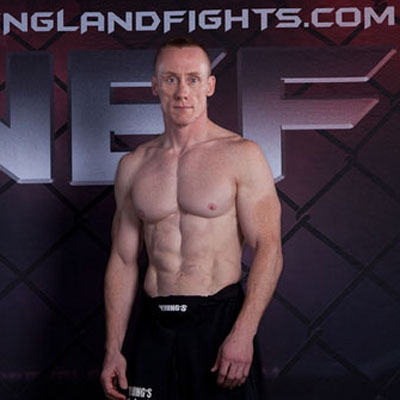 Ewer from Young’s MMA in Bangor, Maine. After a successful amateur career in MMA, C.J. is scheduled to make his pro debut against Zenon Herrera on February 6 in Lewiston. Absolutely. Wrestling at a young age taught me the benefits of working hard and being disciplined. Also, starting at such a young age, I was able to watch my brothers progress through the sport at a much higher level, motivating me to stay with it and be the best I could be. I remember my first wrestling tournament at the “Howland Middle School Tournament” in 1988. I had no idea what was going on, but I remember the only thing I wanted was to go home with a medal that day. Wrestling for Coach Reese at the University of Southern Maine (USM). I have never seen a more dedicated coach to his wrestlers both on and off the mat. I named my first born after coach Reese, literally! The sports are so similar it was an easy transition. The body movements, takedowns and control aspects of wrestling are hard for any other discipline to deal with. You can take the best striker around and he becomes neutralized once a wrestler takes him down. Jiu-Jitsu guys get frustrated with the explosiveness and endurance of wrestlers. The best fighters come from a wrestling background because the best wrestlers have been wrestling since grade school. They develop a lifetime of work ethic, discipline and experience of taking guys down and controlling them. Wrestling taught me the value of work ethic. Any success I had in wrestling came from an approach of pushing myself to my limits every practice in an effort to try to make sure I was outworking any of my opponents. It also taught me to be humble. There was always someone out there better than me and each time I met that person and came out on the losing end, I still had to look the person in the eye and shake his hand after and maintain my sportsmanship.